When Brett Kavanaugh was nominated by President Donald Trump to be a Justice on the Supreme Court, a storm of controversy along party lines erupted which carried over to the first day of the hearing, Sept. 4th. This article, however, is not to take a position either way. That’s the job of political analysts. 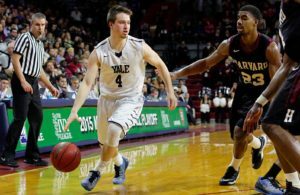 Instead, let’s go back many years, including several spent at Yale University and the city of New Haven, Connecticut, for some interesting background that we have put together appropriate to sports, especially basketball, and ideally suited for Roundball Daily. Brett Kavanaugh graduated from Yale College in 1987 and from the law school three years later, when he was a Notes Editor of the Yale Law Journal. If confirmed, he would join three other Yale Law School graduates currently on the Court—Samuel Alito, Sonia Sotomayor and Clarence Thomas. The above has been widely reported. But what follows are things which most of the public does not know about Kavanaugh, and which fit ideally into what Roundball Daily is all about. Brett Kavanaugh appears much the same today as he did 31 years ago in his Yale class book. 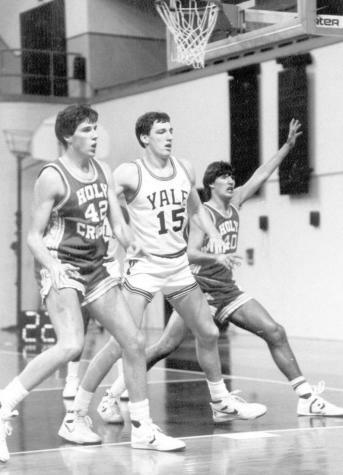 Prior to graduating from Yale, Kavanaugh, who was captain of his prep school basketball team, tried out unsuccessfully for the Yale quintet, coached by Tom Brennan. He failed to make the team, which featured future pro Chris Dudley. But he stuck around and not only played two years on the junior varsity but was the J.V. captain of the 1984-85 team. 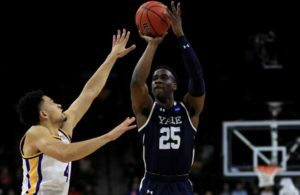 Unfortunately, statistics and photos are rarely kept for that level of intercollegiate sports, and we are still looking for such documentation, other than that his Yale yearbook states he was a J.V. basketball player and captain. In his junior year (1985-86) he switched from being a player to covering sports, mostly basketball, on the college newspaper, the Yale Daily News. He started his writing for the YDN with a football story published Oct. 25, 1983. Switching to the basketball team, in a later article he pointed out, under the headline, “Lackluster Yale needs a boost, lineup shuffle . . .” That was on January 15, 1986. Kavanaugh made mention of a weakness that Yale’s star and future NBA player Chris Dudley would have throughout his college and pro career. “Dudley has been having problems from the foul line, which especially hurts because he goes to the stripe twice as often as any other player,” he observed. That team, however, did stay alive beating Columbia after a loss at Cornell. In those games, Kavanaugh was impressed with Dudley’s performances. 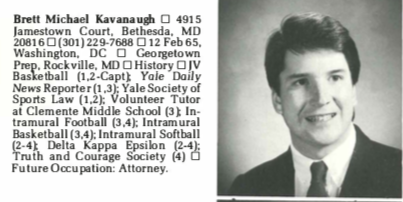 Kavanaugh played football (defensive back) and was basketball captain at prestigious Georgetown Prep in North Bethesda, Md. “He was a pretty good point guard,” recalled Chris Haspel. 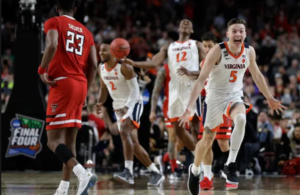 “Our basketball team generally was not good, but he was one of the few that was,” he said in a recent interview on WTOP-Washington. Kevin Dowd, his basketball coach at the prep school, told The New York Times that Kavanaugh was a solid athlete who was easy to coach. He hung out with other Yale athletes. One of his roommates was David White, a wide receiver on the football team. As mentioned above, after he graduated in 1987, Kavanaugh went on to the Yale Law School, and later he taught there as well as at Harvard and Georgetown Law Schools. After he was proposed to be a Supreme Court Justice by Trump, a reporter for the Yale Daily News contacted three of Kavanaugh’s co-residents of the house they occupied as students just off campus at 61 Lake Place, New Haven, across from the Payne Whitney Gymnasium. That was during the 1989-90 school year. The results were very revealing. Steve Hartman is now an associate general counsel at Verizon. Kenneth Christmas is a lawyer specializing in entertainment law. And Jim Brochin is a former partner at Paul, Weiss, Rifkind, Wharton & Garrison, an international law firm headquartered in New York City. Christmas recalled that most of the group of about eight used to watch Jeopardy together, but he and Kavanaugh were greater fans of ESPN’s SportsCenter. “Brett and I were two of the ones that looked upon (watching Jeopardy) with disdain,” Christmas recalled. Brochin said he can count on one hand the number of political conversations the two have had, not only as students but in the more than 25 years that they have known each other. “The most controversial issue I’ve discussed with him is the designated hitter,” he revealed. Christmas also revealed that Kavanaugh was an avid Yale sports fan, and rarely missed a football game at the Yale Bowl, where he hosted tailgate parties even after graduation from the law school. His interest in sports while in college also extended to playing pickup basketball with friends and going to Hawaii for a golf trip during a spring break. Like most Yalies, Kavanaugh frequented Toad’s Place, a campus nightclub, although, according to Christmas, he had “limited dance moves.” Then moving a few doors away, it would be on to Yorkside Pizza for pizza with just plain cheese or pepperoni. This past season, he led the Blessed Sacrament School’s sixth-grade girls’ team to an undefeated season and a citywide championship in the local Catholic youth league. He has also coached the Blessed Sacrament fourth and fifth graders in the Montgomery County Recreation and the Classics AAU second grade girls’ teams. “I have two spirited daughters. Margaret loves sports and she loves to read. Liza loves sports and she loves to talk. I have tried to create bonds with my daughters like my dad created with me. For the past seven years, I have coached my daughter’s basketball teams. The girls on the team call me Coach K,” Kavanaugh said during his speech on July 9, shortly after he was announced as the president’s pick to fill Justice Anthony M. Kennedy’s seat. “I am proud of our Blessed Sacrament team that just won the city championship,” he told Abbie Bennett of the Raleigh News & Observer). “My daughters and I also go to a lot of games. Their favorite memory he said was going to the historic Notre Dame-UConn women’s NCAA semi-final basketball game this year that Notre Dame won, 91-89, on a buzzer beater in overtime. “Unforgettable,” Kavanaugh said. One of his friends is Michael Bidwell, a classmate at Georgetown Prep and now president of the NFL Arizona Cardinals. And he has been a big fan of the Washington Redskins. To this day he still roots for D.C. teams and was the subject of recent articles about once having run up a large credit card balance by charging Washington Nationals baseball tickets for him and friends. A former law clerk told the Associated Press and WTOP-Washington that decades later Kavanaugh still remembered the section and seat numbers his family occupied in the upper deck of RFK Stadium in the 1970s and 1980s. A good athlete, Kavanaugh ran two Boston Marathons. In 2015 he did the course in 4:08.37 after a 3:59.45 in 2010. Chances are that none of the material in this article will make its way to the floor of the nomination hearings. U.S.senators are interested in much more than what a potential Justice of the Supreme Court did in his youth if it did not reflect on his political inclinations. And that is why we thought his great interest in sports merited some special attention – especially here on Roundball Daily. For if his nomination is confirmed, he would become the first “sports junkie” to preside over the highest court in the land, and he used a fitting analogy in his opening statement at the hearings that showed what he is about when he told the committee that a judge must be an “umpire”.